Phillip: Brandon, you don't think the party is a mistake, do you? Brandon: Being weak is a mistake. Without exaggeration, I think this may have been probably my tenth viewing of 'Rope'. It's a film that I can just never tire of, every time I watch the film I get caught up in Alfred Hitchcock's innovative mastery, and on this subsequent viewing not an inch of my admiration for the film or Hitch has at all faded. Two friends orchestrate the murder of an old acquaintance who they believe to be ''inferior''. They throw a party the same afternoon to show the perfection of their crime, but things go awry when their former teacher begins to have suspicions. 'Rope' was adapted from Patrick Hamilton's 1929 play of the same name, The film itself seems to borrow heavily from the idea of its source material because it feels just like watching a play on screen, a play that is Directed by arguably the greatest filmmaker ever made. Honestly, Mr Hitchcock's Direction of this film (or any other) really can not be praised enough. The decision to have to the film take place in the one apartment and seemingly be consistent of a single continuous long shot had to be a risky move at the time, but Hitch provided one of the greatest and most successful cinematic experiment ever brought to the screen. Hitchcock was one of the first filmmakers to find the brilliance in using a minimal amount of locations, it such a genius move in that encourages audience involvement. As an audience member watching 'Rope' it feels like we are just another party member, watching the events unfold. its so involving and makes the experience all the more exciting and suspenseful. I'm not sure that it would be the same film if we were given scenes showing the party members arrive, or Fonz forbid Mrs Wilson buying the patty from the Delicatessen down the street. I love 'Rope's plot so very much, in fact for an English essay in year 11 we had to write about conflict so I simply wrote the entire outline of the films plot. My essay didn't fit the required criteria but the teacher called it a ''riveting read'' so I took that as a personal win. The idea of these two friends, both polar opposites in personality, teaming together to murder one of their friends and attempting to throw in order to orchestrate the artistic element of murder is so ridiculously intriguing that it was just begging to be brought to the screen. Another admirable thing about this film is the subtle subtexts which it explores, most notably the proposition and later denouncement of ''superior'' and ''inferior'' beings and the idea that someone murder someone just to prove that they could. The also features the theme of Homosexuality (in a far more subtle way than 'A Nightmare on Elm Street 2') which was obviously a very controversial issue at the time i.e Leopold and Loeb, which was a major influence on the film. The film benefits from two outstanding central performances from John Dall and Farley Granger as murdering duo of Brandon and Phillip. The performances are fantastic and give such a great contrast to one another, Dall plays the sinister, conniving and ruthless mastermind while Granger is the sympathetic, neurotic, lapdog type. 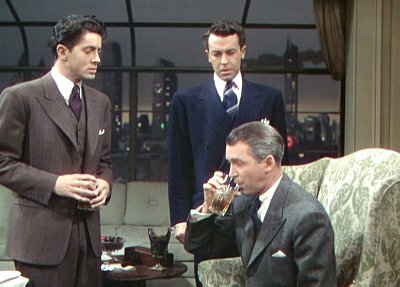 The film also features Jimmy Stewart, which is impossible to be a bad thing. I know that Stewart thought he was miscast in this film but I still believe he gives a terrific showing here and his final monologue is simply awe inspiring and and unforgettable. 'Rope' is a fantastic film. In a career with an unparalleled amount of masterpieces, its easy for some to get lost in the shuffle, and that's what I believe this has happened to 'Rope', being apart of the Hitchcock legacy. It's still a terrific experience and such an innovative effort from a master of cinema.